The new trailer is out as well as the first Battlefront ad, and maybe because of it I’ve been asked by several people (maybe they know each other) to post the rebel without a cause, Han Solo himself. Often typed as ESTP, you can see the clear difference upon meeting Lando, who plays sleazy to Solo’s careless attitude. The longer the series goes on, the more you can see him going from cool and cocky to caring…who is also still cool and cocky. In a world of light speed, countless races and Jedi, there’s got to be a skeptic. Jumping right into it, higher Thinking types tend to be this way. While Te (Extroverted Thinking) only accepts what is “proven” and known, it also builds. Ti (Introverted Thinking) takes apart like how Han dismantles and reassembles parts of his ship. Did I just use Han Solo as an example of Ti when explaining Ti to show how Han operates? Think about that. Solo’s first function is, of course, Ti. He’s skeptical, questioning, and more importantly, the foil to our hero Luke Skywalker. If Skywalker is the guy you are, naive and ready to experience something outside of your home environment, Han Solo is the guy you want to be and maybe even become. He’s rough around the edges, doesn’t take orders from anyone (except himself), and doesn’t even believe in the force when the Jedi would have been around as a council when Han was alive. He would have been a kid, but still. Point being, Ti sometimes takes things too far. The Se Han uses is clear. Extroverted Sensing is so apparent in Han that people often type him as an ESTP, who use Se first and Ti second. Han makes the action happen. Not with lightsabers and the Force of course (Rhymes!) but with “simple” things like his blaster and the Falcon. These possessions aren’t just things that he likes to have because they make him feel cool, he’s working on his ship in every movie or it’s the focal point of at least one conversation in the movie. Mostly because it doesn’t work like it’s supposed to but she’s got it where it counts. One of the biggest stereotypes of the ISTP, and for good reason, is that aside from “X-TREME SPORTZZZ” they love to work on things. It’s the Ti/Se combination of mentally dissecting something (Ti) and physically acting on that thought (Se). To support the theory of Han as the ISTP and Lando as his ESTP buddy, Han is more likely to build the ship and not deal with people well, while Lando is more likely to not know a thing about the ship yet be able to sell it. The Crafter and the Promoter. First. Last. He’s the guy with the gun. One thing I’ve always sort of disliked about the original trilogy is that Han gets more bumbling as the series goes on. When we first meet him in A New Hope, he’s laid back and selfish. He’s even kind of a dummy. But as the series goes on, specifically by the time on Endor in Return of the Jedi, he’s acts pouty. I’ve talked a lot on here about ISTPs going into fits of rage due to their inferior function, which happens to be Fe (Extroverted Feeling). They don’t normally know how to express themselves emotionally so if a situation calls for them to be more level headed in a more personal scenario, they get confused and “BLLLAAAARGH” all over everything. We see that that fiction all the time. What we don’t always see is the more quiet side of the ISTP that isn’t healthy, but also isn’t “BLLLAAAARGH!” It’s more like sulking that could turn into rage if it doesn’t properly subside. It’s the “I’m not getting what I want but maybe I could if I say it like this.” The rage comes in when they don’t know how to deal with something they’re already annoyed with. The sulking is when they’re feeling miserable but not mad. It doesn’t happen often but it’s there all the same and every ISTP will deny it but they know it’s true. 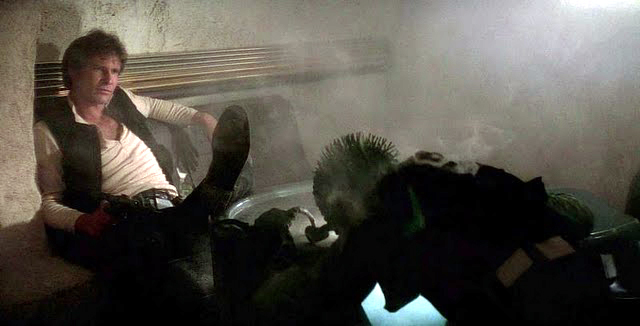 But because that’s not the image of Han I want to leave you with because it’s not the Han I like to imagine, here’s the standard ISTP way of dealing with problems. This entry was posted on 04/21/2015 at 1:19 pm and is filed under MBTI Artisans, MBTI Stuff with tags Han Solo, istp, mbti in fiction, star wars. You can follow any responses to this entry through the RSS 2.0 feed. You can leave a response, or trackback from your own site. He is one of my favourites since my childhood (Indiana Jones also). My father became a pilot because of him(then dropped it- who wants to be in the military, seriously? ).